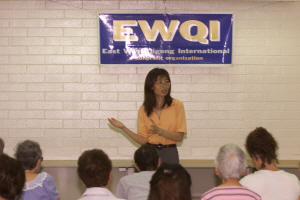 Welcome to the East West Qigong International! New! Free Qigong eBook Available! Learn the basic concepts of practicing Qigong, Taiji (Tai Chi) and Meditation during monthly seminars and have an opportunity to experience Qi---the vital and healing life energy available to all of us. Our Health Seminars will open a doorway to an energizing range of possibilities! "Relaxation of the mind, peaceful feeling; Interesting lecture and experience of mind control." "Relaxing feeling, learned that there is more types of Qigong. Pleased to know Qigong type of health practice available in Hawaii." "I understand the basic concepts of what Qi and Qigong is, which is, I think, the foundation is most important. I felt relaxed and comfortable while meditating." "I experienced my hands tingle when I put my hands together. I feel relaxed during the seminar, I am interested in Qi and Qigong." "Experienced the flow of Qi through my spine. I liked what I learned about Qigong. I love the way you sing Sooooooong."